When you go to Phi Phi from Phuket you experience a very different accommodation style. Phuket has strong modernising influences from it's Chinese heritage and connection with Bangkok. Phi Phi is in traditional Krabi province which has a unique and rich history of local hospitality. Getting to Phi Phi from Phuket takes you from a large island with international airport and hospitals and some of Asia’s most celebrated beach resorts. Phuket enjoys one of the finest selections of 5 star luxury accommodation, resorts renown for the latest in room comfort, superb facilities and service. Resorts like the Amanpuri, and Twinpalms Phuket have a reputation that travels before them. However Phuket isn’t just for the well-heeled. There is excellent value to be had searching through the extensive list of mid range resorts. Many new resorts have beautiful rooms and have deals on to help develop their reputation. To explore the Free Night Specials, Fixed Night Promotions, Special Discounts, Early Bird Offers Honeymoon offers go to this link; Phi Phi Hotel Deals. At the pure budget end there are many locally run Phuket guesthouses especially in the nightlife capital of Patong. Many of these guesthouses or micro hotels are back from the beach and are often in the local streets full of character and experiences waiting to be had. 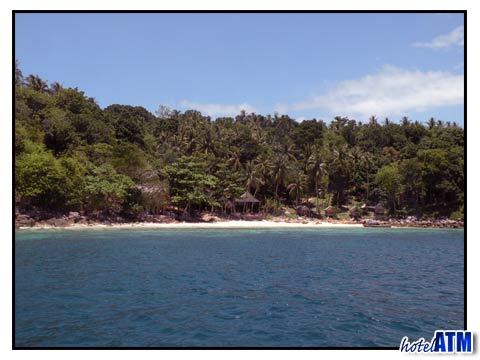 For an interesting article see Cheap hotels in Patong. Getting to Phi Phi from Phuket is fairly straight forward if you are staying in a resort, hotel or guesthouse. Ferry services to Phi Phi from Phuket include the transfer over the mountains to the sea port of Rasada near Phuket Town and your ferry to Phi Phi. If you are coming from Phuket International Airport and your plane arrives after 12.30 pm you will need to stay a night in Phuket on the beaches, or get a hotel near Rasada pier or hire a speedboat to Phi Phi. This is because by the time you get out of the airport and meet your transfer and then take the 40-50 minute drive down to the Rasada pier, the 14.30 boat has left. This is the main beware... warning on getting to Phi Phi from Phuket. Once on the ferry and you are leaving Phuket you can just sit back and enjoy the cruise. The sea passage is particularly pretty as you thread your way through a series of islands like Koh Maitin and Koh Doc Mai. To the south you see the vastness of the Indian Ocean and to the north you catch sight of the intriguing Phang Nga bay, with it's famous James Bond Island, Koh Yao Yai and a further 100 small islands full of caves and mystery. When you finally get to Phi Phi Island you pass between Phi Phi Don and Phi Phi Ley. Phi Phi Ley is where Leonardo Di Caprio made his movie 'The Beach' and this can be seen by tour when you head for Maya Bay. When you arrive at Phi Phi from Phuket you will will come to the main pier at Phi Phi Don Village. The main village is the key area with about 80% of all tourist rooms situated here. Along the beachfront there are some fine resorts like the Phi Phi Island Cabana Hotel, the Mama Beach Residence and Andaman Beach Resort. Inland there are many budget resorts and cheap guesthouses. Other key beaches with accommodation are Long beach, Runtee Bay and Maya Bay. Long beach is just 5 minutes from the main pier and is ideal if you want the buzz of the main village but actually would like a more peaceful stay. Long beach is right on the coral reef Hin Phae and has sensational views of Phi phi Ley and the Tonsai Tower cliffs. Runtee bay is the new beach where a few hardy souls have put together some simple traditional beachfront resorts. Complete with mosquito nets, nestled under the jungle covered mountain, these resorts appeal to those who like a quiet holiday watching an unchanging horizon, absorbing the tropics in every delightful detail. Going to a luxury resort on Phi Phi from Phuket requires one further transfer. 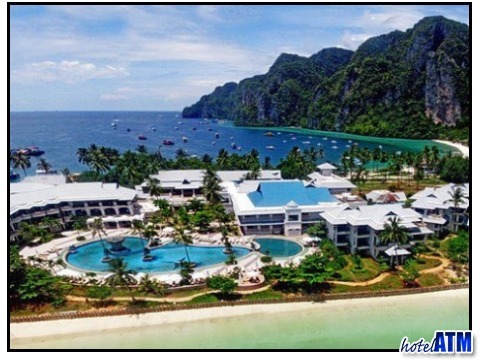 The Zeavola Phi Phi Resort, Holiday Inn Phi Phi Island, Phi Phi Island Village Resort And Spa are at Laem Tong Beach and Loh Bagao Beach. These beaches are in the quiet north of Phi Phi Don Island and get you a pick up from the main pier by the resorts staff. When you get off the ferry you will see a sign board for your resort and your name on it. Just follow this!